Northern Brisbane, Marchant covers the mid-northern suburbs of Chermside, Stafford and Gordon Park. Map of Marchant’s 2012 and 2016 boundaries. 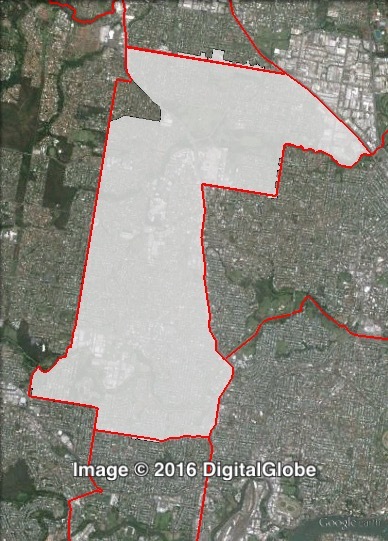 2012 boundaries marked as red lines, 2016 boundaries marked as white area. Click to enlarge. Marchant underwent minor changes, with part of Aspley transferred to McDowall. These changes cut the LNP council margin from 16.9% to 16.6%, and the mayoral margin from 17.9% to 17.6%. Labor’s Terry Hampson won Marchant in 1994. He was re-elected in 1997 and 2000. In 2004, Hampson was succeeded by Labor candidate Faith Hopkins, who held the seat with a 3.8% margin, which was cut to 3% in the 2008 redistribution. At the 2008 election, Liberal candidate Fiona King defeated Hopkins with an 11% swing. King was re-elected in 2012 with a further 8.9% swing. Marchant is the kind of ward which had been held by Labor before losing control of council in 2008. The LNP has gained a cumulative swing of about 20% over the last two elections. This suggests that there is capacity for the LNP to lose a lot of support, but a 16.6% margin is still very sizeable, and may not be possible to overcome in one campaign. 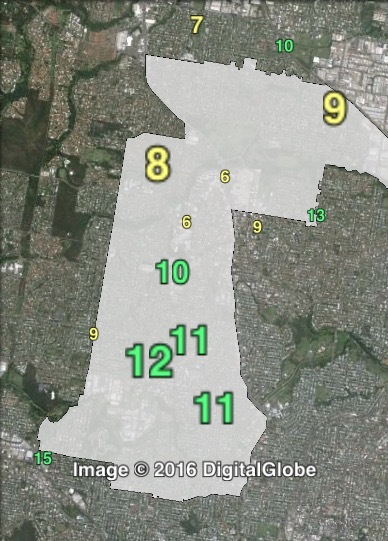 Polling places in Marchant at the 2012 Brisbane City Council election. Central in green, North in blue, South in orange. Click to enlarge. Booths in Coorparoo have been split into three parts: central, north and south. The LNP’s two-party-preferred vote ranged from 68.6% in the north to 64.7% in the south. The Greens polled between 8% and 9% in the centre and north, and 11.3% in the south. Two-party-preferred votes for councillor in Marchant at the 2012 Brisbane City Council election. Greens primary votes for councillor in Marchant at the 2012 Brisbane City Council election.